Versace T-shirt in jersey with crystal floral and signature Medusa graphic. Crew neckline. Short sleeves. Semi-fitted. Straight hem. Pullover style. Versace T-shirt in jersey with crystal floral and signature Medusa graphic. Crew neckline. Short sleeves. Semi-fitted. Straight hem. Pullover style. Cotton. Made in Italy. Versace T-shirt featuring box logo with floral, tiger, and leopard graphics. Crew neckline; snaps at back. Short sleeves. Pullover style. Versace T-shirt featuring box logo with floral, tiger, and leopard graphics. Crew neckline; snaps at back. Short sleeves. Pullover style. Cotton/spandex. Made in Italy. 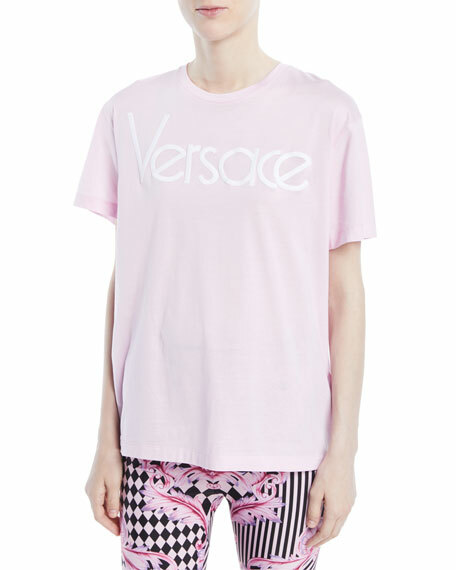 Versace T-shirt in hibiscus-print jersey. Logo-print at back. Crew neckline. Short sleeves. Classic fit. Pullover style. Cotton. Made in Italy. Versace tee with golden logo on front. Crew neckline. Short sleeves. Straight fit. Pullover style. Cotton. Made in Italy.